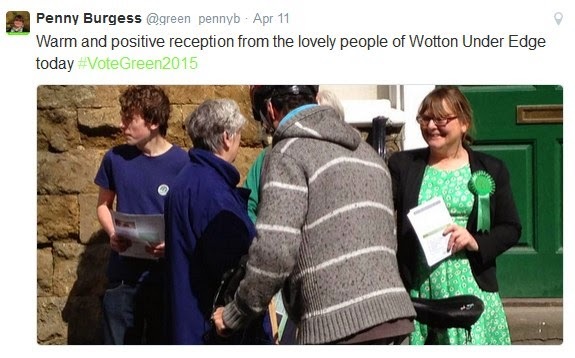 Penny Burgess, the Green candidate for the Cotswold Constituency, was out and about in Wotton on Saturday. She will also be at Wotton hustings Monday 13th April. See the post from 30th March. She is also taking part in Hustings in Cirencester's Sundial Theatre at 6.30 on 23rd April. Free tickets are available from the Wilts and Glos Standard office. The newspaper is expecting a 'fierce political debate'.